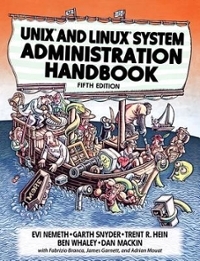 thefamuanonline students can sell UNIX and Linux System Administration Handbook (ISBN# 0134277554) written by Evi Nemeth, Garth Snyder, Trent Hein, Trent R. Hein, Ben Whaley, Dan Macklin, Dan Mackin and receive a $28.98 check, along with a free pre-paid shipping label. Once you have sent in UNIX and Linux System Administration Handbook (ISBN# 0134277554), your Florida A&M University textbook will be processed and your $28.98 check will be sent out to you within a matter days. You can also sell other thefamuanonline textbooks, published by Addison-Wesley Professional and written by Evi Nemeth, Garth Snyder, Trent Hein, Trent R. Hein, Ben Whaley, Dan Macklin, Dan Mackin and receive checks.